It is the season for many things magical, including glittering Christmas lights displays. The lights on Liberty campus have already been lit, but there are also many other places nearby to get your dose of awe or nostalgia. Some are single family homes, such as 171 Churchill Road in Forest, or are businesses like Forest Automotive. Other large displays in neighboring towns may be worth the trip. In Bedford that creativity is especially notable with the two well-known displays in town: Liberty Lake Park and the Elks Home Campus retirement home. Along with lights, both also use many painted wood cutouts that look like they were homemade and well-loved over the years. GLOW — This display on Churchill Street is one of many light displays in Lynchburg. Hand-painted signs bid visitors to drive slowly and remember the reason for the season, and cutout characters from classic Christmas cartoons smile at their audience. At the century-old retirement home, the elk statue that poses outside the main entrance is recruited as a reindeer for the month, a lit sleigh slung up behind him. For a more modern display of blazing technical prowess, there is a house about a 15- to 20-minute drive from Liberty’s campus, behind Rustburg Elementary School. Turn down Webbs Way Drive to the back of the school parking lot and the place cannot be missed. The house’s yard is lined with trees, hoops, snowflakes and giant piano keys of lights. A star is on the roof and a nativity scene and cross stand close to the side. 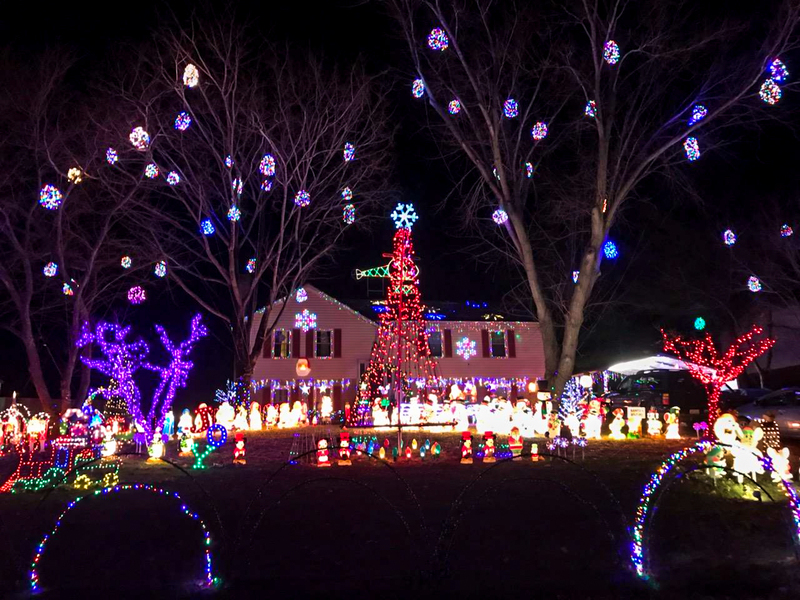 The owners, the Frazier family, have set up a radio frequency with Christmas music and synchronized their lights to flash, fade and change color in a dazzling light show. In Lynchburg, the large drive-through display will be “A Celebration in Lights” in Riverside Park starting Dec. 7. Rachel Smith is a programmer with Lynchburg Parks & Rec, which organizes the event. Many of the 30 individual displays are put together by Smith and her team, but others come from local businesses and organizations who want to contribute. The winding lane of lights is usually best viewed from a car, but there will be a pedestrian night Dec. 14 and a night of carriage rides and hot cocoa Dec. 20. After seeing the local light extravaganzas from Bedford to Rustburg, Johnson said that her love for Christmas lighting came from nostalgia.